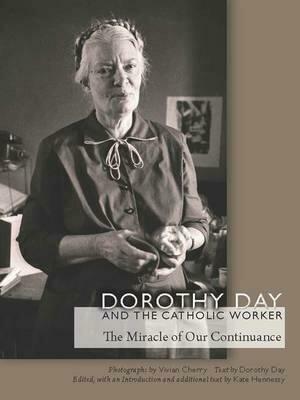 Compelling and prophetic, Dorothy Day is one of the most enduring icons of American Catholicism. In the depths of the Great Depression and guided by the Works of Mercy, Day, a journalist at the time, published a newspaper, the Catholic Worker, and co-founded a movement dedicated to the poorest of the poor, while living with them and sharing their poverty. In 1955, Vivian Cherry, a documentary photographer known for her disturbing and insightful work portraying social issues, was given unprecedented access to the Catholic Worker house of hospitality in New York City, its two farms, and to Day herself. While much has been written about Day, the portrait that emerges from Cherry's intimate lens is unrivaled. From the image of the line of men waiting for soup outside St. Joseph's on Chrystie Street to pictures of Day and others at work and in prayer, Cherry's photographs offer a uniquely personal and poetic glimpse into the life of the movement and its founder. In this beautiful new book, more than sixty photographs-many published here for the first time-are accompanied by excerpts of Day's writings gleaned from her column "On Pilgrimage" and other articles published in the Catholic Worker between 1933 and 1980. The result is a powerful visual and textual memoir capturing the life and times of one of the most significant and influential North American Catholics of the twentieth century. The aptly paired images and words bring new life to Day's political and personal passions and reflect with clarity and simplicity the essential work and philosophies of the Catholic Worker, which continue to thrive today. The Introduction and additional commentary by Day's granddaughter Kate Hennessy provides rich contextual information about the two women and what she sees as their collaboration in this book. In 2000, twenty years after her death, Archbishop of New York John J. O'Connor of New York City opened the cause for Dorothy Day's canonization, and the Vatican conferred on her the title of Servant of God. The Catholic Worker continues to flourish, with more than 200 affiliated houses in the United States and overseas. The miracle of this enduring appeal lies in Day's unique paradigm of vision, conscience, and a life of sacrifice that is one not of martyrdom but of joy, richness, and generosity-vividly portrayed through these photographs and excerpts.